Carlos Franco does not have any MLB stats for the season. November 2, 2018 1B Carlos Franco elected free agency. October 13, 2018 1B Carlos Franco assigned to Toros del Este. August 26, 2018 Gwinnett Stripers activated 1B Carlos Franco from the 7-day disabled list. August 16, 2018 Gwinnett Stripers placed 1B Carlos Franco on the 7-day disabled list retroactive to August 15, 2017. 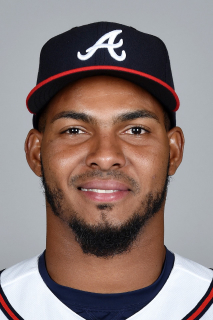 February 23, 2018 1B Carlos Franco assigned to Atlanta Braves. December 27, 2017 3B Carlos Franco assigned to Leones del Caracas. October 14, 2017 3B Carlos Franco assigned to Toros del Este. May 19, 2017 1B Carlos Franco assigned to Gwinnett Braves from Mississippi Braves. March 20, 2017 3B Carlos Franco assigned to Atlanta Braves. January 5, 2017 3B Carlos Franco assigned to Tigres de Aragua. October 20, 2016 3B Carlos Franco assigned to Toros del Este. April 4, 2016 3B Carlos Franco assigned to Mississippi Braves. March 16, 2016 3B Carlos Franco assigned to Atlanta Braves. November 6, 2015 3B Carlos Franco elected free agency. April 6, 2015 3B Carlos Franco assigned to Carolina Mudcats from Rome Braves. April 1, 2013 3B Carlos Franco assigned to Rome Braves from Danville Braves. June 16, 2012 Carlos Franco assigned to Danville Braves from GCL Braves. July 26, 2010 Carlos Franco assigned to GCL Braves from DSL Braves. May 22, 2009 DSL Braves signed free agent Carlos Franco.